Similar to removing medical conditions from your skin, lasers can also help reverse the effects of the sun and time. Sun spots, uneven skin, and even unwanted hair are easy to remove. Also knows as LimeLight Facial, IPL Photofacial is a non-invasive approach to skin revitalization. The procedure helps improve skin tone and surface imperfections associated with aging and photodamage. Areas that can be treated include any part of your face, neck, or neckline with skin redness, tiny veins, or brown spots (even light and previously difficult to treat spots). One to three treatments are typically sufficient to see results. 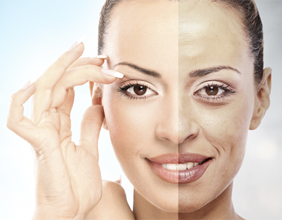 Following treatment, you will notice brown spots start to darken and your skin may appear red and slightly swollen. This is normal and will last from a few hours to a day. In 1-3 weeks darkened spots will start flaking off and fade and redness will be reduced and any mottled complexion improved.